Among the 7,000 freshmen who arrive on the Urbana campus each fall, approximately 125 are selected as Chancellor’s Scholars. 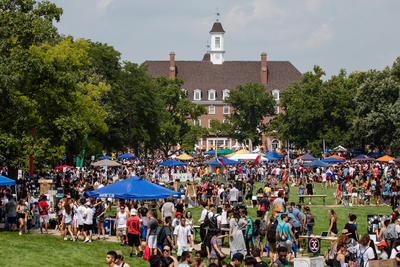 CHAMPAIGN, Ill. — One hundred fifty-nine freshmen and sophomores at the University of Illinois at Urbana-Champaign have been designated Chancellor’s Scholars, chosen for their academic excellence and leadership potential, in the Campus Honors Program this fall. The Campus Honors Program is a four-year general studies program open to undergraduates in any curriculum. It admits approximately 125 freshmen each year, selected from over 7,000 on the Urbana campus. Additionally, approximately 25 students join the program at the beginning of their sophomore year. Chancellor’s Scholars participate in small-enrollment honors classes and seminars. Close student-faculty interaction also is fostered by a mentor system, a lecture series on topics of general interest, dress-rehearsal visits to Krannert Center for the Performing Arts and international programming. Other benefits include summer research and travel grants.